As temperatures rise and ecosystems change, many plants are in danger of rapid decline. In the foothills around Boulder, the osha plant, wild sarsaparilla and many different species of sedges are threatened by reduced moisture, hotter weather and other effects of climate change. Artist Matthew Mazzotta used these Boulder County-specific plants in his travelling exhibit Harm to Table on Sept. 21. Mazzotta collaborated with local Boulder chefs, climate scientists and foodies to create a piece of public art to showcase food made with area-specific ingredients in danger of decline over the next 20-40 years. Mazzotta is a conceptual artist who works to create community spaces for people to gather and interact as part of art, and with his travelling Harm to Table show, he hopes to spark conversation. “That’s one thing that art can definitely do, is bring people into a conversation that they weren’t expecting to be a part of,” Mazzotta says. 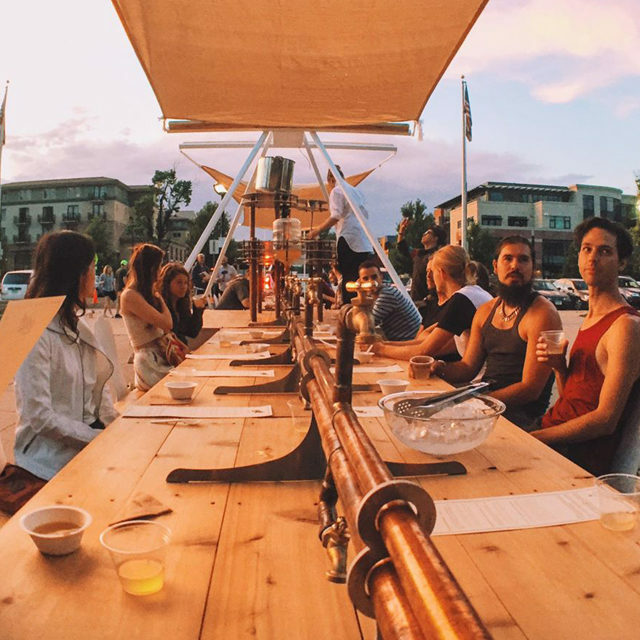 To create Harm to Table, Mazzotta constructed a large, wooden table with tubs of wild sarsaparilla and sweetgrass soup and ponderosa osha kombucha in the center.